Joe Miller appeared in the hoops for the first time against Dundee on 14 November 1987. I cannot recall another Celtic player, on his debut, making such a huge impression as Joe did at Parkhead on that day. He gave a thrilling performance on Celtic’s right wing and scored in the process. Time and again he danced past hapless Dundee defenders to create chances for the Celtic forwards in a 5-0 romp. 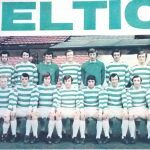 Celtic had been missing a quality player on the right flank since the demise of Davie Provan and here we had a player who was so exciting that people were quickly making comparisons with the great Jimmy Johnstone. 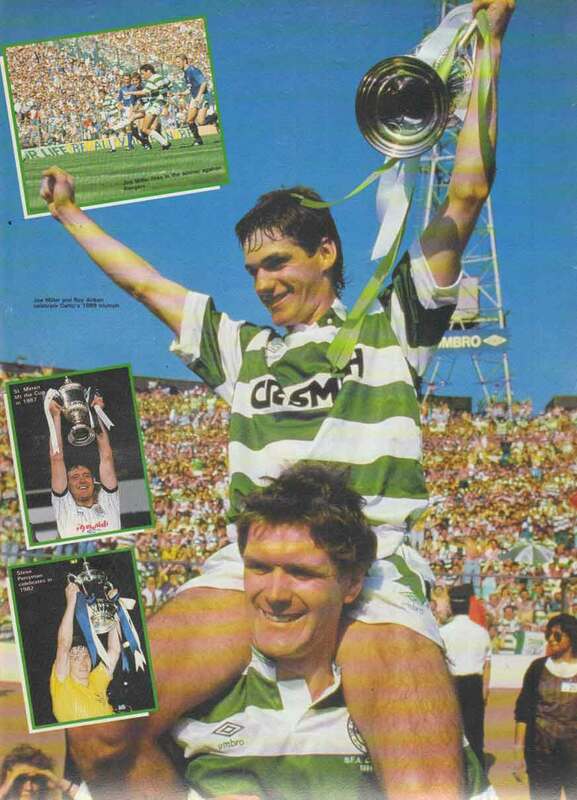 Joe went into Celtic folklore as part of the centenary double winning side of 1988. He played a major part in this and probably his most telling contribution was the dramatic last minute winner at Tannadice on Boxing Day when he scored with a diving header, much to the glee of the huge travelling Celtic support on that cold December day. He had a marvellous match when he returned to Pittodrie in difficult circumstances in April 1988 and played his part in the dramatic Scottish cup semi final and final against Hearts and Dundee United respectively. In the summer of 1988 a long fruitful relationship was forecast for Celtic and Joe Miller. However injuries and inconsistency were to curse Joe the following season. On 1st April 1989 Celtic found themselves 2-0 down at home to Rangers at half time and Paradise was not a happy place to be for those of us with a Celtic persuasion. Andy Walker pulled one back and all of a sudden Rangers were creaking under Celtic pressure. When Richard Gough conceded a penalty late on for hand ball it was Joe who grabbed the ball confidently for Celtic’s penalty, fighting off Roy Aitken in the process. His shot was weak and Chris Woods saved easily but the ball rebounded to him and he, inexcusably, fired his shot over the bar. That miss had cost Celtic the opportunity of a merited draw. Redemption would not be long in coming. On May 6th Celtic played Hibs at Parkhead. A larger than usual crowd had turned out due to Scottish cup final tickets being on public sale at the turnstiles ( how times change !) 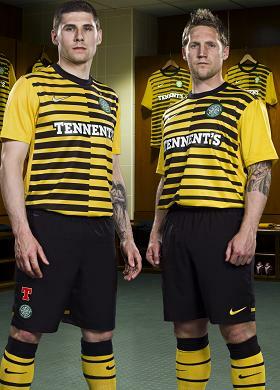 for the game against Rangers two weeks later. Manager Billy McNeill had a dilemma as he was short of strikers. Frank McAvennie had recently departed to West Ham, Andy Walker had injured an eye and was out for the season and new signing Tommy Coyne was ineligible for the forthcoming final. 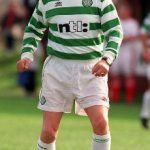 McNeill then gave Joe the number 9 shorts and he scored the winner in Celtic’s low key 1-0 win. One week later and Celtic had their final league game at Love Street. This game is best remembered for the media circus who followed Mo Johnston who was seated in the stand after professing his undying love for Celtic. Miller again scored the game’s only goal, running from halfway and scoring with a fine shot. 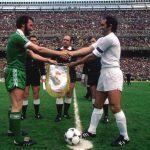 As the cup final loomed there were many of us who were confident that Joe could win Celtic the game. He had a new lease of life playing at centre forward, was expressing himself in a new attacking role and had clearly thrown off the shackles of being limited to playing on the right wing. And so it proved at Hampden. Many Celtic fans will remember the sweltering heat that day and also Joe’s winning goal when he took advantage of a Gary Stevens’ error to bring the old trophy back home to Celtic Park. Joe’s sharpness and pace had also continued to stretch Rangers in the second half. The memory of his horrible April penalty miss was banished on that scorching summer’s afternoon. My recollections of after that game are of all hell breaking loose in Glasgow. I spent that night in the Queens Bar in the Gorbals and the journey back to Govan later that night was an enlightening experience. 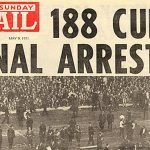 The Sunday papers told the news the next day of a night of violence throughout the city and even the windows in La Fiorentina’s restaurant at Paisley Road Toll were smashed. Maybe the authorities should have called for a summit back then. McNeill’s gamble had paid off. Joe had played three games as Celtic’s striker and scored the only goal in each of the three games. Incredulously, McNeill was never to give Joe an extended run in the team as striker, which he had deserved, and it was back to the wing beat for the wee man. By late 1989 a lot of strain was showing at Parkhead and Joe’s relationship with the manager became heated. In the League Cup semi final defeat to Aberdeen at Hampden, Joe had replaced Steve Fulton as a substitute but after Aberdeen had scored McNeill had decided to haul his sub back off which was both unnecessary and humiliating for the young Celt. Celtic lost 1-0 and it was clear all was not well. Although this was not to be a great period for Celtic the talents of Joe Miller could still shine through. In March 1990 Celtic faced Dunfermline in a Scottish cup quarter final replay. Paul McStay started the night well with a typical long range thunderbolt shot to open the scoring and in the second half Joe clinched it. Running from the centre of the park he beat three Dunfermline defenders and when he was through on goal he managed to poke the ball past the goalkeeper for an exquisite goal. In September 1990 he scored the goal of the season against Hibs at Parkhead when he played a one two with Dariusz Dziekanowski and crashed an unstoppable volley past Andy Goram from a tight angle. It was a stunning effort from a player who seldom showed this form that we all knew he had in him. Liam Brady’s arrival in 1991 initially gave Joe renewed energy but when Brady signed the enigmatic Stuart Slater the writing was on the wall for Joe. Despite Slater’s unconvincing performances Brady continued to play Slater in an attempt to justify his heavy expenditure. And so, in the summer of 1993, Joe Miller returned to Pittodrie to sign for Aberdeen. There can be no argument that Joe Miller made his mark at Parkhead. 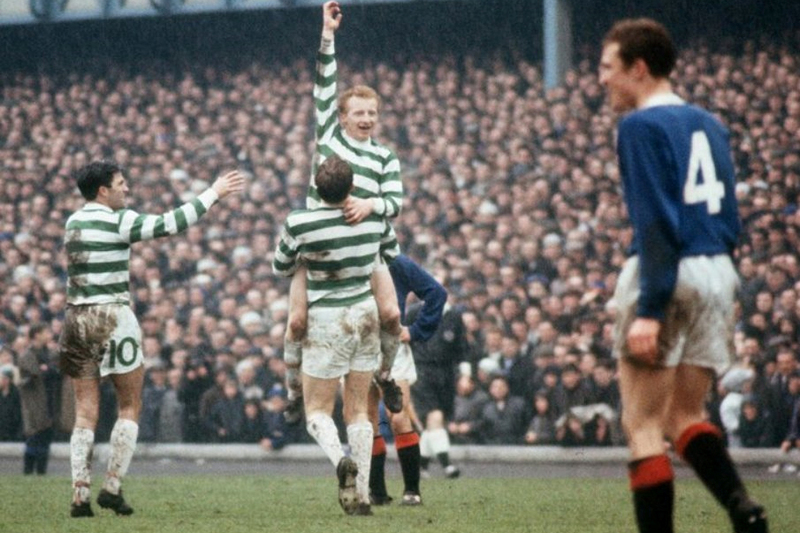 As a hero of the centenary team and the man who scored the winner in an Old Firm final he will always be fondly remembered by the Celtic fans he entertained. However there is a nagging doubt that we only scratched the surface of his talent and had Celtic played him regularly in a more natural attacking central role then Joe Miller may actually have gone on to fulfil his huge potential in its entirety.